Flamingos would make a magnificent huddle. The 5.8 magnitude earthquake that hit the East Coast on Tuesday caused some ruffled feathers (and fur and scales) among inhabitants at the Smithsonian's National Zoo. Zookeepers noticed a change in some of the animals' behavior just before the earthquake hit, and they released their observations to the public the following day. Many of the apes quit eating and climbed up their tree structures about five to 10 seconds before the shaking started. Several animals shrieked and otherwise voiced their distress just before the earthquake, including the apes. And the red ruffled lemurs began voicing their distress 15 minutes before the quake hit. The beavers and a species of duck took to the water during the quake. Just before the earthquake, the flock of 64 flamingos huddled into a tight ball of pink feathers and stayed that way during the tremors. The giant pandas did not appear to respond to the earthquake at all, zookeepers reported. No animals, staff or visitors were injured during the earthquake. So how do animals sense when an earthquake is coming before we humans do? 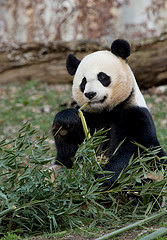 The Washington Post reported that National Zoo staff believe animals are more tuned in to nature than humans are since they need to read those signs to help them survive environmental change. Elephants, for example, can hear infrasonic sounds below the levels that humans can hear. In short, if your cat start freaking out, you might want to grab her and run to higher ground. But don't count on your pet panda for any help during a natural disaster. That picture makes that panda look a little....special. Especially within such context. Poor lazy bamboo eater! 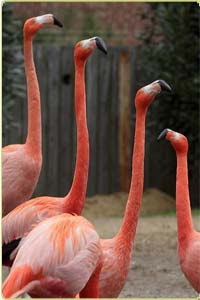 But the wise flamingos look nothing but regal.